Did you know that September is National Rice Month? In light of this celebrated month. KRUPS, the leading manufacturer of coffee and other various kitchen appliances is hosting a Facebook and Twitter giveaway for a KRUPS 4 in 1 5-Cup Rice Cooker in honor of this beloved holiday. Celebrate your love for rice by entering to win this new must-have kitchen tool. Not only just a rice cooker, this appliance can also be used as a slow cooker! 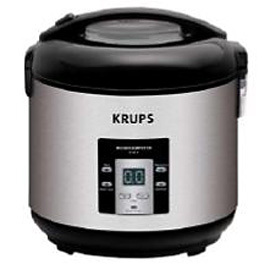 Starting Monday, September 26th and ending Friday, September 29th at 5 PM EST, post a photo of your old rice cooker or tell them why you need a rice cooker on their Facebook wall - KRUPS USA http://www.facebook.com/KrupsUSA or #KrupsUSA on your Twitter page - http://twitter.com/Krupsusa to enter for a chance to win the rice cooker.